For improved energy efficiency and beauty, few upgrades to your home make an impact like new windows. When you work with Naperville window contractor Siding & Windows Group for your window replacement, you can rest assured that you’re getting the highest possible level of craftsmanship and service. 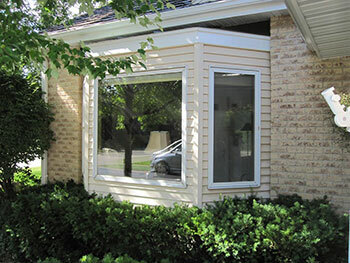 When you need a window contractor in Naperville, Siding & Windows Group is your trusted vendor. With all the recent advances in window technologies, you don’t have to put up with drafty, leaky windows any longer. Wood replacement windows provide a classic, beautiful appeal for your home. Traditional wood looks great and offers excellent thermal insulating properties along with low maintenance, easy repair and durability. Our brands include Marvin, Pella and Andersen. Vinyl replacement windows are available in various textures and colors to match any home aesthetic. Today’s energy-efficient vinyl windows can be custom-built to match virtually any size or shape you need. We proudly offer Alside vinyl windows for their unparalleled beauty and high level of energy efficiency and low maintenance. Fiberglass replacement windows offer a number of advantages, including a high level of durability. Fiberglass windows also provide superior strength and insulating ability, and they resist condensation. We offer Integrity by Marvin. When you invest in replacement windows for your home, you want to work with a Naperville window contractor you can trust. Siding & Windows Group is one of the most experienced window replacement and window installation providers in the greater Naperville area, and we are dedicated to your satisfaction. Why do hundreds of clients trust Siding & Windows Group? We have an approval rating of 100 percent. We’ve been in business for more than 30 years. We’re a recognized leader in window replacement, remodeling and siding. We have an excellent reputation throughout the area. We’re fully bonded and licensed. We consistently win awards and recognition throughout our industry, including Angie’s List Super Service Award for 2010-2014; the GuildMaster Award from GuildQuality for 2010-2015; the A+ Rating from Better Business Bureau; and many others. We offer financing options through Synchrony Bank, including 0% for a year. We provide exceptional craftsmanship and product warranties. If you’re ready to upgrade your home with beautiful replacement windows, our professional installers are ready to assist you, and we offer in-home estimates at no cost. For more information and a free estimate, please contact us today or call (847) 251-4200.